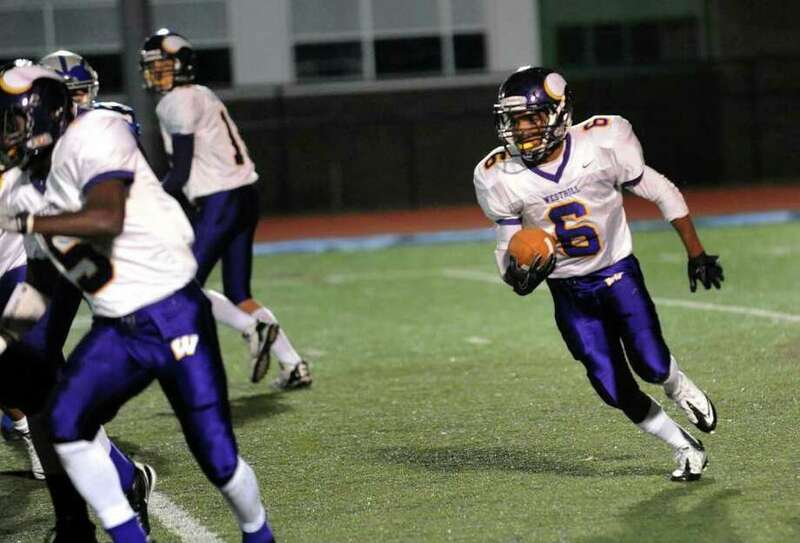 Westhill's #6 Akai Jackson carries the ball, during football action against Fairfield Ludlowe in Fairfield, Conn. on Friday November 12, 2010. Westhill's QB Peter Cemanski gets ready to throw a pass, during football action against Fairfield Ludlowe in Fairfield, Conn. on Friday November 12, 2010. Fairfield Ludlowe's #14 Ryan Moore fails to tackle Westhill's #5 Travis Williams as he crosses into the endzone for a touchdown, during football action in Fairfield, Conn. on Friday November 12, 2010. Fairfield Ludlowe's #24 Nate Ryan carries the ball over 60 yards for a touchdown, during football action against Westhill in Fairfield, Conn. on Friday November 12, 2010.